A self-confessed control freak, routine is a big part of my success strategy, so much so I become almost ritualistic about certain things. 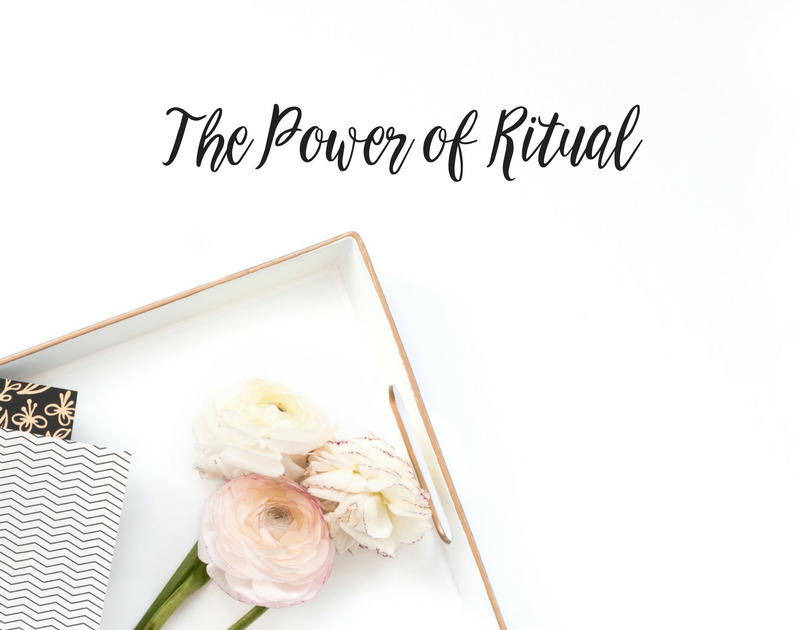 Have you heard of the power of ritual? How often do you brush your teeth? It sounds like a silly question, and your answer is, of course: every day. You don’t even think about it; it just happens like clockwork. As a result you have a prettier smile, less tooth decay and gum disease, and far fewer dental bills. In other words, this simple daily ritual is perpetually transformative. As adults in an over-stimulated and stressful world, it’s difficult to create habits like this. We feel powerless to control what’s going on in our heads, much less stay focused and disciplined enough to make big life changes. Mass media plants slick mantras in our minds, seducing us into believing that we can be happier, more successful, and sexier without making any changes—all we have to do is consume an endless array of products. As a result, we’ve lost touch with our inherent power to heal, grow, and manifest our fullest potential. And despite all the material abundance in our lives, we suffer. The best way to quiet the mind and unlock your inner power is to start small when creating new daily rituals. Through the ancient teachings of yoga, we know that our thoughts lead to actions; our actions become habits; our habits form our character; and our character determines our destiny. Daily ritual is the act of taking positive thoughts and putting them into action. You are what you think, because what you think determines what you do. Once a positive ritual takes hold in your life, you don’t even need to think about it. Just like brushing your teeth—it just happens. You can connect with and reclaim your power starting right now, and if you stick with it, you can transform your life. Here are five small steps to help you start your journey. Close your eyes, take a few deep breaths, and ask your deeper self, “What would I most like to shift or manifest in my life right now?” Use your answer to create a simple, positive statement of intention. Who deeply touches and inspires you? Perhaps it’s a loved one, dear friend, or great teacher. Make them your power symbol and visualize your commitment to them every time you need a boost. Just as you brush your teeth every day, remind yourself of your intention first thing every morning. Take small, gentle steps in that direction with confidence and conviction. Don’t let anything get in your way—reaffirm the positive habit every day until it becomes second nature. We have been conditioned to expect change to happen quickly and effortlessly. True transformation however, takes time. As you honor your ritual every day, release your need for a quick outcome. Just do it because you know in your heart it’s good for you. The outcome will present itself when it—and you—are ready. Remember, you created the positive habit of daily brushing even though you hated it as a kid. Your oral hygiene is important, but it pales in comparison to your spiritual well-being, and the fullest expression of the amazing person you truly are.